The snow and ice of the recent polar vortex made it clear that nobody was going outside, not even to fix a leak in the roof. Michigan is among a number of states battered by the sphere of frigid, arctic air, putting cities like Detroit under 15 degrees below zero. Understandably, people wouldn’t want to risk it anyway as the polar vortex was downright dangerous. Yet, polar vortex or no polar vortex, winter simply isn’t the ripe time for reroofing, especially with asphalt shingles. If roofing projects have already begun, Detroit roofing contractors, such as Kroll Construction, race against time to get them done before winter. 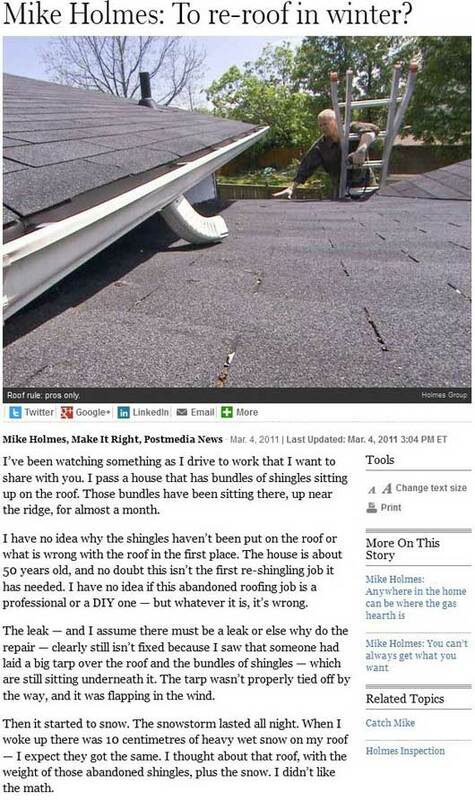 They don’t, as Mike Holmes writes, leave bundles of shingles uninstalled on the roof. There are hardly any roofing jobs that occur while snow falls all around the neighborhood. If it’s asphalt shingles, the reason is justified. Many asphalt shingles in the market feature a special adhesive that runs along the length of the tabs. These adhesive strips are made from a special asphalt formula, most likely different from the asphalt in the shingles themselves. In addition to proper nailing, the adhesive adds anchor strength to the shingles, allowing the tab to resist high winds better. For the adhesive to stick, however, heat must activate it. Under warm weather, the adhesive will soften and stick to the underlying shingle. It’s unclear how long the asphalt shingles should stay in the heat, but experts estimate between several days and a few weeks. Nevertheless, roofers are certain about one thing: cold weather is reroofing’s enemy. Frigid and snowy conditions present a safety issue to Detroit roofing contractors and their roofers, which is why few take on these projects during winter. If there are a substantial number of roofers during this time, it may be a rare exception, or probably an emergency job order. Among the most common temporary fixes is roofing tarp, which covers part of or the entire roof and its damage and protects it from the elements for a time. Roofers will be back in full force once winter gives way to spring where better weather conditions make extensive roofing and reroofing possible. Spring, in other words, is roofing season.